A friend at Fresh Energy generously called me the “architect” of Minnesota’s new solar energy standard (signed last week), and although that may be a bit generous, I’d like to provide a detailed description of the nation’s newest solar energy standard. A CLEAN contract / feed-in tariff / standard offer for solar projects 1 MW and smaller, IF investor-owned utilities file to create the tariff. A $5 million incentive pool for solar projects 20 kW and smaller. Net metering increased from 40 kW to 1 MW for investor-owned utilities. The solar energy standard requires the state’s investor-owned utilities (representing about two-thirds of state electricity sales) to supply 1.5% of their energy sales from solar power by 2020. This is in addition to the 25% by 2025 (30% by 2020 for Xcel Energy) required under the state’s existing renewable energy standard. The number is a little more complex than that, since in the political horse-trading, large industrial electricity customers of certain utilities were also carved out of the standard. They were carved out when the standard also included a 1.33% assessment on utility bills to provide the incentives for the long-term contracts for smaller-scale solar. The assessment died before the bill passed, but the share of electricity sold to these large electric customers remains exempted from the standard. So in practice, the solar standard is 0.88% solar by 2020. No wonder Otto von Bismarck compared legislating to sausage making! Additionally, 10% of the standard is carved out for small solar projects (up to 20 kW), or about 45 MW by 2020. One of the core pieces of the legislation is a 20-year, standard contract for solar projects under 1 MW, if their interconnecting utility files for an “alternative” value of solar tariff. The value of solar concept has been most prominently practiced by the Austin, TX, municipal utility. For eligible projects, they do not “net meter” their energy usage but separately purchase all their power from the utility and sell all their power to the utility at this value of solar price. The price changes annually, but reflects the market value of solar to the utility, including the time and value of energy delivered, avoided transmission and distribution costs, etc. The law also empowers the responsible state agency and public utility commission to include the value of local manufacturing, systems installed at high value locations on the grid, and other factors. 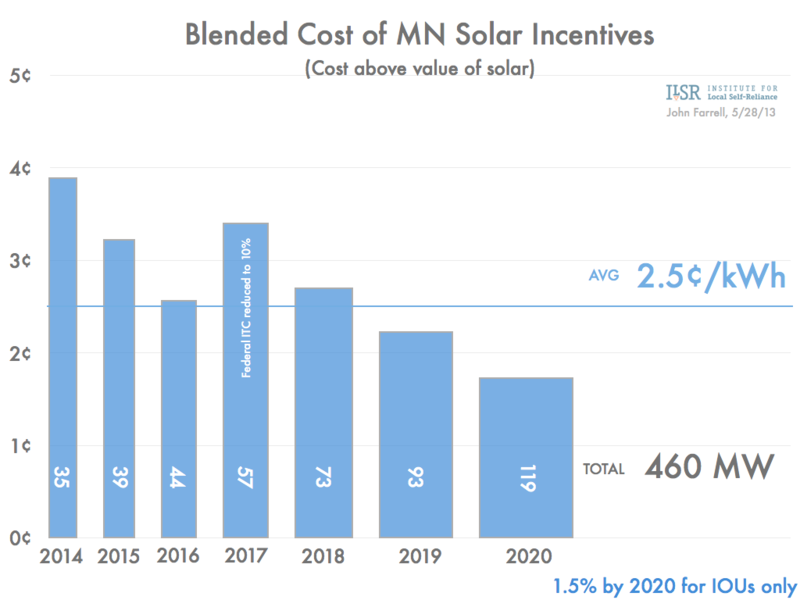 In two ways, the value of solar in Minnesota will work like Austin: the price will adjust annually and solar producers under the tariff will separately buy and sell all of their electricity. 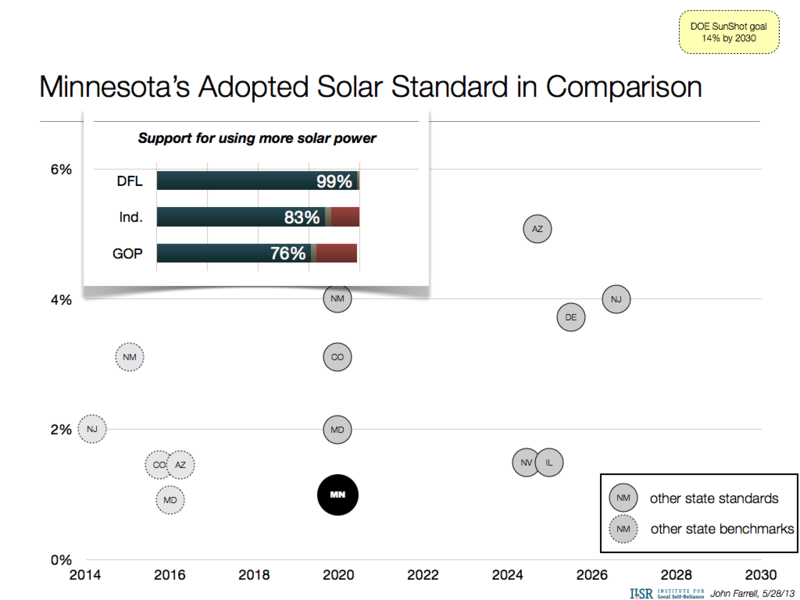 However, Minnesota solar producers will lock in the price on a 20-year contract when their project comes online, whereas Austin producers receive the recalculated price each year. There’s no guarantee that this will works as well as net metering. Advocates of the policy wanted customers to be able to choose between net metering and value of solar, giving the utility an incentive to develop a reasonable alternative to a policy they have grown to despise. But the legislation as passed lets utilities replace net metering with a value of solar tariff, and the only safety is a requirement that the value of solar not be less than the retail electricity price for at least 3 years. With utilities concerned about losing market share to homes and businesses generating their own power, this may prove problematic, to say the least. For the next five years, solar projects 20 kW and smaller in Xcel Energy’s territory will receive a production-based incentive to help bring them to market. The incentive will be production-based (on a per kilowatt-hour basis) and will last for 10 years. 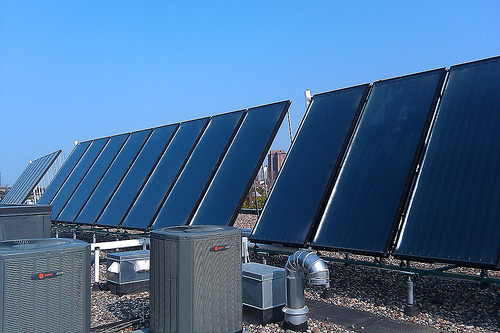 The incentive can be combined with net metering or with a value of solar 20-year contract. The incentive pool is quite small, with just $5 million being taken from the state’s Renewable Development Fund (just a one year after such legislative allocation was expressly forbidden by law), an account populated by payments from the utility in exchange for storage of spent nuclear fuel at its two nuclear power plants in the state. 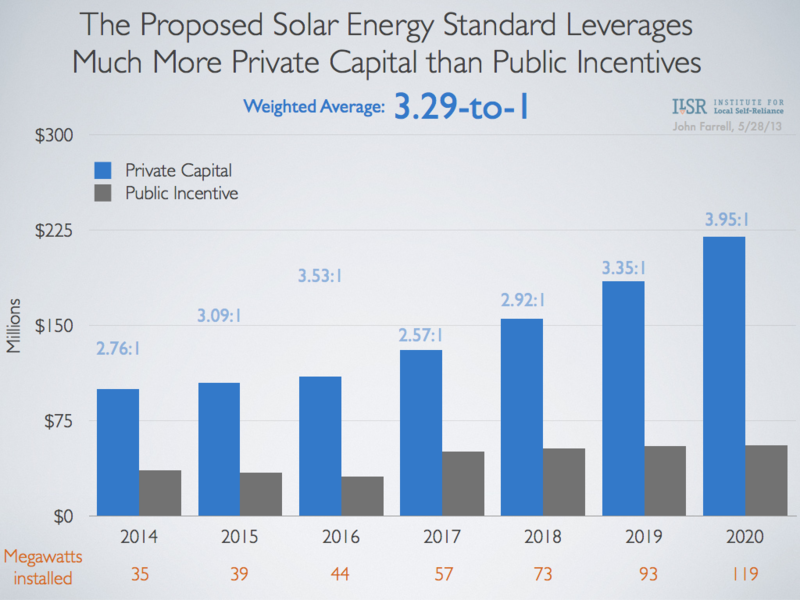 The incentive pool is also not likely large enough to finance all of the small solar eligible under the carve out. My back of the envelope calculation (more in a future post) suggests that there’s enough money for perhaps two-thirds of the eligible project capacity. Minnesota’s 1981 net metering law was one of the first in the nation but in the 30 years since it had fallen behind. The net metering cap was raised from 40 kW to 1 MW for investor-owned utilities (no change for municipal utilities and cooperatives), but with some concessions to utilities. Net excess generation receives avoided cost – under the original law, any production in excess of onsite consumption – “net excess generation” – was still redeemed at the retail electricity rate. For projects over 40 kW, net excess generation will now receive avoided cost (approximately one-third the price). Systems must be sized to 120% of on-site electricity use. Previously, systems merely had to come in under the 40 kW size cap. Delightfully, there are no limits on the amount of capacity that can be developed as community solar. Minnesota’s new solar energy standard will grow installed solar capacity 30-fold from 2013 to 2020, with strong provisions for community-based solar projects and smaller-scale solar. If it works as designed, it will cultivate a robust industry and drive down prices to new lows, encouraging expansion of the policy in future years. But Minnesota’s new law is hardly the most ambitious standard, with a total requirement for the state’s investor-owned utilities that sums to less than 0.9% of electricity sales by 2020. It also fails to grow the pool of investment in clean energy, tapping existing conservation and renewable energy funds rather than using the proposed assessment to get a 3-to-1 return on public investment. Finally, it remains to be seen if the value of solar concept will result in a more fiscally sustainable strategy for utilities to accommodate more solar power or an opportunity for them to squash competition in the name of their shareholders. In a year when not many states made any progress on clean energy, Minnesota’s solar champions should be applauded for their heartfelt efforts to bring more clean, local solar to the Upper Midwest. I hope it works as intended.